To use the language of the economist, [the modern industrial system] lives on irreplaceable capital which it cheerfully treats as income. I specified three categories of such capital: fossil fuels, the tolerance margins of nature, and the human substance. The book runs into some challenges around scale. Schumacher understands and appreciates that population density is something to celebrate in as far as it enables cultures to flourish. However, he also suggests that city size should not exceed 500,000 persons. He argues for a vision that makes rural life sustainable, simultaneously acknowledging that some communities might be suffering from too much migration to justify revitalisation. He discusses at length the necessary tension around a human need for order and a human need for freedom. Both needs establish a space for structured flexible thinking. 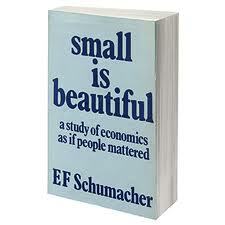 Schumacher owns and embraces the paradox, but I am not surprised to see how Schumacher’s adherents have really focused on small-scale technologies in rural areas after reading the book. Given that Schumacher wrote in 1973, I’m impressed to see a discussion of the human substance. Current frameworks about human well-being have some interesting things to learn. Arguably, Schumacher concludes that meaningful work represents a core component of the human substance. This entry was posted on 19 July 2011 by practicinghuman. It was filed under Uncategorized and was tagged with academic, book review, development, engineering, environment, living with technology, minimalism, poverty, wacky possibilities.